Yet another photo where I can not remember where I was when I took it same as the previous W Gash photo I presume, any clues anybody? I do have quite a few photos of Nottingham City Transport yet to come so probable a club trip down that way. The photo doesn’t show it too well but bus is in a very dark green and cream. Its Mount Street bus station in Nottingham. The buildings in the background are part of the old General Hospital. The bus livery is actually Dark Blue and Cream, the same as Midland General. Thanks for that its nice to know where I have been. I am in two minds to change the shot to a black and white as it is very bad colour wise if that is supposed to be Blue, it was Ilford film should of stuck to Agfa perhaps. My memory is probably faulty but I remember travelling on a light blue regal on Midland General’s E4 route and lighting in Crich village where I was to spend the weekend at the tramway museum. I think that MG delighted us enthusiasts by the fact that it bucked corporate dictate from Tilling HQ by not having a Tilling red/green livery. As I recall Midland General had a light blue livery. 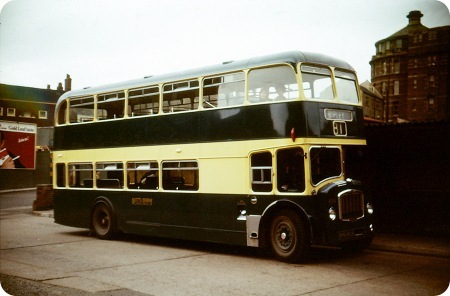 It had two subsidiary companies Notts & Derby, including the trolley buses that came to Bradford, wore a dark blue livery whilst Mansfield and District wore non-tilling green. In due course al three fleets assumed NBC leaf green. I think this very dark blue was a latter-day variation. The original was not actually "light" blue, but a very nice, almost royal blue. I think it was actually the same for both MGO and NDT. Have a look here http://www.busslides.co.uk/search_bus_pictures_east_midlands.php (and scroll down) for a few examples. Memory plays tricks doesn’t it, had I already said that?, but wasn’t the blue featured on the dual purpose vehicles (in reverse livery) a darker shade than the blue used on the service buses? Andrew, yes it certainly was – in fact it was so dark as to be almost, or perhaps actually, black – but only in the later years. The classic (bus) livery was, to my mind, "real blue". It was an honest to goodness full-bodied shade, and I judged all others (harshly!) by it, including the "washed out" blue that Cambus later used, and the ghastly fading "rail blue" that British Rail slopped all over everything in sight. The blue used from pre war was Williamsons Azure Blue and Tilling cream. Earlier the vehicles carried a lighter blue relief. National bus days meant a change from the cream to white and more blue and so this looked a lot darker but all my investigation would suggest that this was indeed the same colour – it’s always a talking point at rallies between myself and other owners of ex MGO vehicles! I have been involved with several preservation projects all being finished in this colour. Hope this clears things up a bit. I too can confirm that MGO and Notts & Derby Traction wore the same livery, at least post-war. I knew it was an Azure blue, was Williamsons Azure blue a reference to the one time general manager? Did he in fact choose the colours? I have mixed feelings of Mount St bus station. 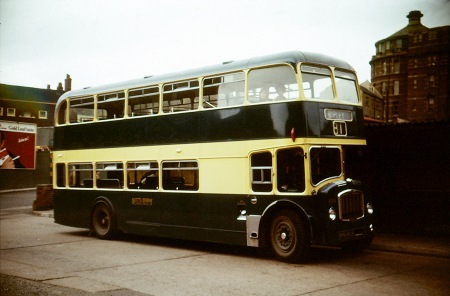 The mix of MGO, NDT, Barton and Trent buses was exciting to me as a child, but I also suffered from travel sickness, so by the time we arrived there from Langley Mill I was feeling quite queasy. Returning to the subject of the blue paint, I remember at one time my parents having a bathroom in MGO cream and a bedroom window in MGO blue. These things could happen when you lived near a bus depot. And when my mother and I moved from Surrey to Southsea, the house was almost battleship grey throughout, inside and out. It wasn’t long before a neighbour told us that the previous occupant worked in Portsmouth Dockyard and the guy was known in the street a Paintbrush Brill! When I got around to demolishing the ancient shed, it had been made from sailors’ packing cases, still bearing their names, ranks and numbers! I worked for the railway workshops in Derby, and certain senior managers were believed to have made a little freely with, shall we call them, "surplus materials" and "rail blue" colour schemes were not unknown. (Why anyone should have so little taste as to want their house painted that colour I do not know – now MGO blue, that’s a different matter!) Of one such manager I heard the comment that "It’s fortunate xxxx lives nowhere near the railway – If a train passed by and whistled the house would get up and follow it!" As for Williamson, I seem to remember this was a fairly well-known industrial paint manufacturer. I fear I may have mentioned this before but when we lived in Brislington, Bristol, our neighbour worked for Bristol Commercial Works and around 1957/8 brought home a "spare" 5 gallon drum of silver chassis paint which he then applied to the stonework of his house. It is still clearly visible to this day although I doubt the owners have quite worked out why their house has a fair amount of silvery flakes in the natural stone facings! An NBC paint shop foreman once told me that all ‘leftovers’ of paint in tins used to be mixed together, this produced a sort of muddy plum colour which was used to paint under stairs, wheelarches, inside luggage boots etc. When the NBC issued it’s corporate identity diktat, it was ordered that a grey colour must be purchased and used for those areas (and indeed wheel centres) After that, all leftovers were thrown away. So much for the economies of a national organisation! No surprise there, Chris B! Williamsons are still in business from their Ripon Headquarters. They have supplied various colours of British Railways paint for projects underway at the Vintage Railway Carriages Trust Museum at Ingrow on the Worth Valley Railway. The quality of the paint is excellent – it is a pleasure to work with. You are right Stephen, T & R Williamson did, and still does, manufacture specialist paints and varnishes for the transport and industrial sectors. They are based up here in North Yorkshire, in the historic city of Ripon. Williamson’s were well known in the bus and railway world for their coach enamels and varnishes, which had a reputation for quality and durability. They have since kept pace with the modern demand for two-pack paint applications and the like, and the firm is well over two hundred years old. The original Williamson’s building greets visitors and travellers as they approach the city from the south on the A61.